Master minded by Andrea Olivia from Cittaarchitettura, this Italian home architecture is what we call the simplest “modern minimalist”. The landscape is flat and the contemporary house design simple through and through with a nice simple rectangular shape. The home architecture has flat roofline and neutral white grey palette wall which makes it really stands out against the natural backdrop. Concrete and plaster front porch is the two main elements that define this countryside home design. 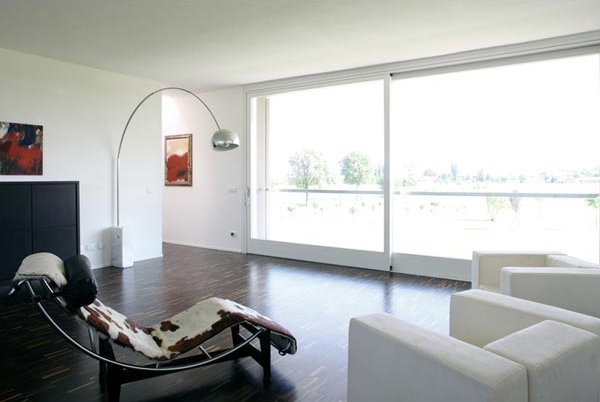 Windows are simply clean which is just perfect with the contemporary faced of the structure. Inside this home plan, the interiors are so bright and airy with a nice speckled staircase. Above all those exquisite things we’ve mention this house actually is an eco house design. The above flat roof is equipped with solar panels to accommodate the electricity need of the house as well as hot water. Get to know more at Cittaarchitettura.